What makes a tree foam up when it rains. What I mean you can see the rain water running down a tree and on some trees there will be a stream and big puddle of foam at the bottom. It's very noticable on black birch. I never thought much of it til my wife asked me about it today. Maybe it make a more rabid decent down the trunk of some than others. I really laughed when I read your post. Tree foam? Then I remember wondering something very similiar when I was a kid. I'd be hiking up in the high mountains and see foam on a small pool in a creek or on a lake somewhere. I suppose the same mechanism that causes tree foam also causes lake foam. Now, I'm talking the high mountain of Montana where there's no one around, so it's not human caused. I've heard that foam on choppy water is caused by protein. Phosphates. It is what is blamed for seafoam and foam in rivers that flow through forests with heavy accumulations of rotting leaves. It might be washed from a living tree. Then it might be caused by an insect too. There are insects that cover themselves with foam for protection. Rain might wash this to the ground. See spittle bug. 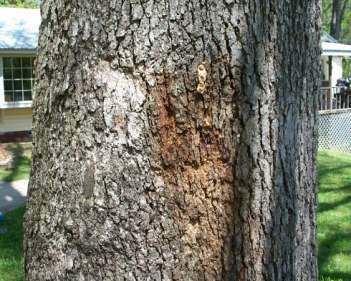 Are you saying that the trees have rabies and that they are foaming at the mouth (roots). some proteins form foam. Fire departments use foam and one of them is protein based. Protein is based off nitrogen in the plant. Don't know about your tree. This is my best guess. Does the foam sorta resemble this? 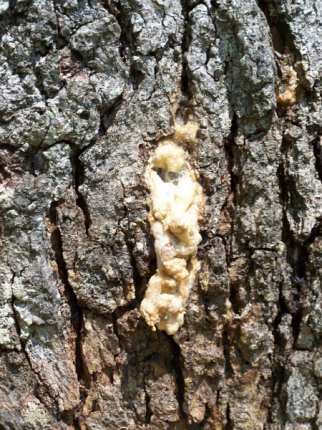 This is the slime flux referenced by ohsoloco on a white oak. Any idiot can write a woodworking blog. Here's mine. Would that be similar to what I see happen to cherry logs? In the past I've picked up some cherry from tree services, and after sitting for a little while the logs form a jelly-like substance on the ends. It appears to be coming from the cambium layer...or at least in that area. On the cherry it is injury induced and they don't actually have resin canals like a spruce or pine. Not sure who mentioned anything about resin canals, but SD is right - the jelly-like substance you find on black cherries is sap that is released in response to injury. It helps prevent insect infestation. The slime flux shown in the pictures is a bubbling foam caused by bacterial infection of the heartwood. Just me drawing comparisons. There are in fact some hardwoods with resin canals but not commercial in US and Canada. I have seen a lot of foam at the base of yellow birch this spring, after leaf out. I just equate it to whatever is in the bark as the water runs down and changes in surface tension when air is mixed in. Like blowing bubbles with soap. Is yellow birch prone to flats too? Forester cut the trees around the base..Girdled trees? Cutting the little trees out from under the big trees. Page created in 1.135 seconds with 39 queries.